Recently Jimmy Carter spoke frankly about his potentially fatal struggle with cancer. In view of this disturbing news, we are likely to see many assessments in the national media about the former president’s role in American history. Journalists will praise his efforts to advance peace in the Middle East. They will salute his years of service to Habitat for Humanity and acknowledge Carter’s international work promoting health and democracy through the Carter Center. These glowing assessments will be countered, however, by references to inflation and economic recession during his White House years (as well as the Iran hostage crisis). Many believe that Carter failed to deliver economic progress, while the president who followed him, Ronald Reagan, fostered an economic boom. We do not neglect Reagan’s achievements if we recognize that the historical situation in the 1970s and 1980s was more complex that this invidious comparison suggests. To be sure, Carter displayed shortcomings. Jimmy Carter was not consistently effective in his handling of national affairs, and he was not as skilled in communication as Ronald Reagan. Carter’s statements about policy were sometimes contradictory or vague, and his relationships with members of Congress were often tense. But Jimmy Carter does not deserve the harsh criticism on economics that is commonly directed at him. His leadership was not the primary cause of recession in the Seventies, and one of his most important presidential decisions put the United States on a road to economic recovery. Jimmy Carter assumed the presidency in early 1977 and served during some of the worst times of “stagflation.” In 1979, petroleum prices surged again. Annual inflation in the United States reached an astounding 11.3%. Inflation climbed to 13.6% in 1980. Carter talked about creating a long-term energy policy that would reduce the American people’s heavy dependence on fossil fuels, and for the short term he recommended personal cutbacks in energy consumption. Many Americans criticized these proposals. In August, 1979 Jimmy Carter made an appointment that proved wise for the U.S. economy in the long run but hurt Carter’s chances to hold on to the presidency. The President selected Paul Volcker to chair the Federal Reserve. Volcker took quick action to deal with the vexing problem of inflation. Under his leadership, the federal funds rate climbed to 19.1% in 1981. The prime rate briefly hit 21 ½% in December, 1981.Volcker’s Fed also reduced the money supply. These bold actions eventually put the brakes on inflation. But the remedies were painful. The Fed’s policies slowed the entire U.S. economy. Building projects came to a halt. Farmers, who relied on heavy borrowing and mortgaged property, felt like they were in the midst of a full-blown depression. Yet ultimately the Federal Reserve’s strategy worked. By late 1982 and early 1983, it became clear that the Fed had broken the back of inflation. The U.S. economy healed, and in subsequent years business and employment improved. During the Volcker-led squeeze, G. William Miller, Jimmy Carter’s Secretary of the Treasury and Charles Schultze, chairman of the Council of Economic advisers, worried that the Fed’s actions could spike unemployment, deepen the recession, and sink the Democratic president’s reelection chances. They questioned aspects of Volcker’s plan. Despite criticism from these leaders and others, President Carter generally supported Volcker in public statements. Admirers of Ronald Reagan boast that his economic policies brought victory in America’s long battle with stagflation. Economic progress returned in the 1980s, they note. It was “Morning Again in America.” Reagan succeeded where Jimmy Carter failed. This dramatic contrast is far too simple. Reagan’s leadership played a role in the recovery, but the Republican president was lucky, too. He reaped the benefits of Jimmy Carter’s decision to appoint Paul Volcker. Reagan was lucky in another respect. The expansion of global oil production in the Eighties loosened OPEC’s stranglehold on the U.S. and global economies. Some of the major producing countries, including the biggest, Saudi Arabia, released more oil into the international market. New wells in the North Sea, Mexico, Alaska, and other regions added to global supplies. By 1986 oil prices were only a fraction of the elevated levels they had reached late in Jimmy Carter’s administration. As energy costs declined, corporations paid less to manufacture and transport goods than had been the case in the late 1970s. American workers no longer had to surrender large portions of their earnings to fill their cars with gasoline or heat their homes. After energy costs plummeted, the U.S. economy turned healthy. 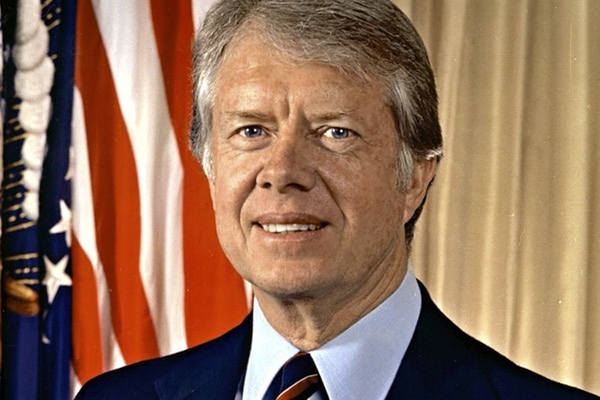 When journalists assess Jimmy Carter’s place in history, they should recognize that Carter’s policies were not the principal cause of difficult economic times in the Seventies. No leader could easily or quickly overcome the challenges. At least Carter tried to deal with the crisis, most notably when he named Paul Volcker as Fed chairman. That decision contributed to Carter’s loss and America’s gain.